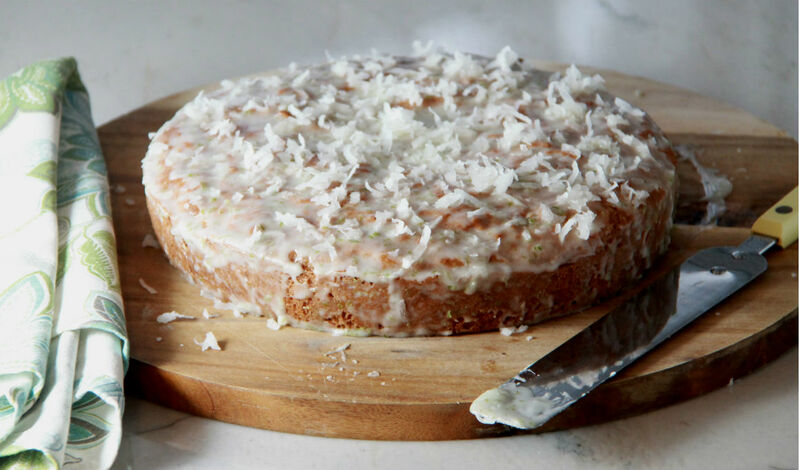 Last week one of my favorite food blogs, Smitten Kitchen, shared a vegan coconut cake. Made with just 6 ingredients; one bowl, baked in a round cake pan for just 30 minutes. Could it really be that simple? I admit, I was skeptical since I’ve had so many epic fails trying to conjure up baked goods for my vegan daughter. I scanned the ingredients, flour, baking soda, salt, vinegar, coconut milk and coconut oil. Wait a minute, no flax eggs, no aquafaba, and where are the dates? And it calls itself a vegan cake! Again, could it be that simple? I had to give it a try, and while trying, add a bit of my own flair with the addition of lime to the batter, and some zest and juice to the glaze as well. The result? Fabulously rich, moist with a nice little zing from the lime, and sweet crunch of flaked coconut on top. Wouldn’t it be fabulous if all gluten free/vegan baking was this easy? Line a 9" round cake pan with parchment then oil well with coconut oil. In a large bowl combine gf flour, almond flour, baking soda, salt and zanthan gum. Make a well in the middle and add the coconut oil, coconut milk, vinegar and juice and zest of 1 lime. Mix well then pour into prepared pan and slide into the oven. Bake 30-35 minutes or until toothpick inserted into the center comes out clean. Cool in pan for 10 minutes then slide knife along the edge to loosen cake and remove from pan. Let cake cool almost completely before adding the glaze. For the glaze whisk together the confectioners sugar, lime juice and zest. Add coconut milk by teaspoon until a silky smooth consistency is achieved. Smooth over cake all the way to edges with some cascading over the sides. Scatter with shredded coconut and serve.